The Yoga Forest is a sacred sanctuary with ancient Mayan altars and natural springs that have been protected as a Natural Reserve in order to honor the land and the heritage of its people. Connect to Mother Earth and create space for transformation and self healing. Enjoy daily yoga and meditation in beautiful natural Temples, as well as regular Kirtan & Song Ceremony, Ecstatic Dance and Sound Healing. Unwind and restore with our Wellness Packages and cleanse & detox in the forest sauna. You can climb our unique cliffs, swim and paddle board in the lake, hike the volcanoes, or just relax in a hammock, all while finding authentic connection within an intimate community space. Simple and powerful programs that create a sacred space for all to work through personal transformation, discovery and connection. Retreats are filled with opportunities for authentic self expression and connection, insights, and tools that can be applied to your personal and professional life. Through various meditation, yoga, reiki, healing arts, Thai Massage, creative writing, Song and Sound Ceremony, and Sacred Plant medicine retreats, we invite you to uncover deeper layers of Self and practice the art of living in the present moment. Within each of us lies a guru, a wise one who knows the truth behind each of our thoughts, words, and actions, an ancient soul that sees through to the essence of all things. Through our RYT200 & RYT300 Yoga Teacher Trainings we will help reveal the voice of this wise one, giving you the tools and language you need to share the spiritual practice of yoga and empowering you to trust in the channel of truth you carry. Empower yourself, feed your soul and step into the path of your highest Self. Explore a fusion of the practice and philosophy of the mystical traditions of Nada Yoga, Mantra, Bhakti Yoga and Sound Healing. Learn how to journey into a deep meditative inquiry on the Source of all Sound and find many tools to assist in shifting frequencies, healing emotional and psychological scars and opening parts of the heart and mind that you never knew existed. Enjoy the peace and tranquility of mountains looking out over Lake Atitlán towards volcanoes San Pedro, Toliman and Atitlán. Offering a unique retreat space within a tropical forest with amazing views, comfortable beds, delicious vegetarian meals, daily yoga and meditation and friendly community living. Specializing in Yoga Teacher Training programs with Kula Collective, Transformational Retreat offerings with renowned international facilitators, Permaculture courses, Thai Massage and Sound Trainings. The Yoga Forest incorporates a balance of teaching, discussion and practice of traditional and modern yoga styles and infuses a shamanic connection to the Earth and her cycles. As yoga is fundamentally an experiential, inner inquiry, students and guests are encouraged both to be aware of checkpoints, and to explore how the practice feels and manifests in their body during any given yoga experience. All levels are welcome, always! The Yoga Forest shares conscious living as a spiritual practice, offering a unique retreat space for self connection, connection to the Earth, and personal growth. We live, work & play harmoniously in nature, creating inclusive abundance and a safe space for personal transformation and authentic self expression. Through intercultural relationships of respect, we weave together local and global visions that inspire positive social and ecological impacts in the world. Founded as a conscious living experiment, through a desire for living simply, greenly and in communion with everything surrounding us, the Forest life is a a practice of Deep Green Yoga. In yoga, we clear the body and mind making space for wisdom and deeper understanding to flow freely and openly through us. By creating this space, we allow ourselves to experience our fullness and connection to everything around us. Deep Green Yoga expands this concept by observing the natural systems around us and working with nature so that the inherent wisdom of the entire eco system can fully flow, creating an open and thriving container for life and all expression. Yoga and Permaculture both ask you to be observant, thereby developing a greater awareness of your effect on the world around you. Taking mindful actions in caring for the mind, body, and environment, we create a deep connection with the earth. Permaculture looks to nature as a model for creating a more sustainable culture. It assumes that by observing natural patterns, making conscious decisions, and managing resources well, we can live harmoniously and productively, with less work and less waste. More than just a retreat center, The Yoga Forest shares a conscious business model integrating three pillars in a balanced practice of earth care, people care and fair share. Integrating our understanding of what it is to be a conscious business, through social, ecological and economic structures, we recognize that this journey will be ever unfolding. 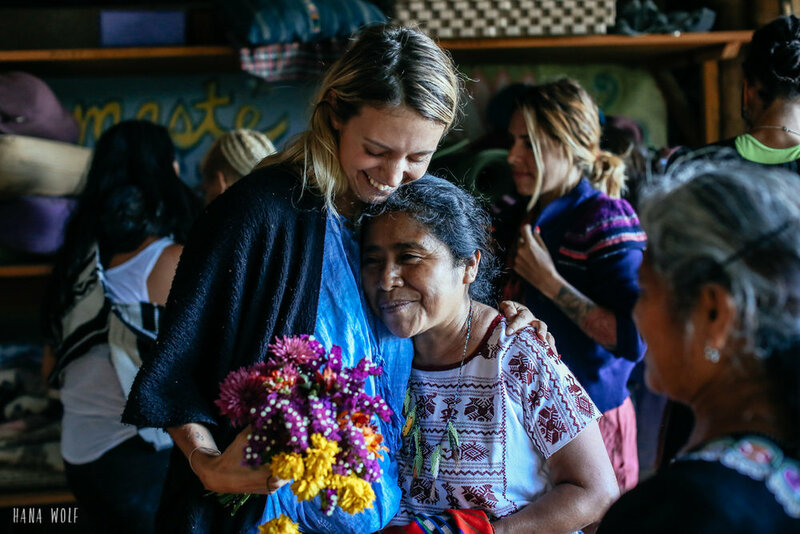 Through our non-profit Forest Family Foundation, we strive to support and integrate conscious living practices in the local community through humanitarian and ecological projects, while sharing the principles of working within nature creating interactive landscapes of beauty and productivity. Together, with the help of amazing foreign staff and a beautiful crew of local Mayans, many wonderful things have been created here and there is always more to be done. We love to connect with people who prioritize a way of life that harmonizes nature with spirit, if that's you, check out our Work Opportunities. The Yoga Forest has been built using various natural and traditional building methods. We use solar energy for simple electricity and hot water, natural grey water filtering systems for our kitchen and outdoor showers, and outdoor composting toilets to return our offerings to the earth. We try our best to produce as little waste as possible and continue to explore new endeavors to create a more sustainable retreat lifestyle.